i need the description in hindi………. Namaste! I have a question on the topic Saptha Shalaka. I am learning Astrology and in very initial stages of my learning. Sun, Venus, Mercury and Saturn are transiting Scorpio as on date (26-Nov-14). 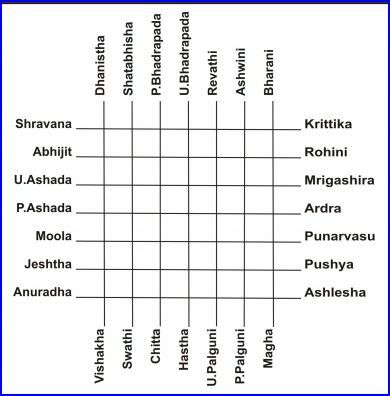 there is a Vedha to Dhanishtha born natives due to transit of the above planets? Do we always say Vedha being there based on entry of planets in the nakshathra causing vedha or does it mean these vedha causing planetary transits to the next nakshathra removes / nullifies Vedha. For example, right now, Sun / Mercury are in Anuradha nakshathra and Venus in Jyesta. Would we still consider Vedha being there for Dhanishta born natives or not. Request your guidance in this regard. As long as those planets are in Vishaka Nakshatra they will block all good effects of those planets if are in good places from natal Moon i.e.people born in Dhanista Nakshatra. Once they move out, blockage is removed and good or bad effects as the case may be will happen. Remember this is for Transit effects only. Thanks a lot for your insightful response.